ARE YOU READY TO TAKE YOUR REAL ESTATE BUSINESS TO THE NEXT LEVEL? WORKING WITH PERSINGER GROUP AND USING THE CLIENTPATH™ PROGAM BUILDS A FIRM FOUNDATION FOR YOUR CAREER & CONNECTS ALL THE DOTS. BUILD A BIGGER AUDIENCE. INCREASE YOUR REFERRALS. GET MORE CONSISTENCY AND PEACE OF MIND IN YOUR BUSINESS. In the ever changing landscape of business, marketing and technology today, the ClientPath Program™ is not a Magic Pill or Shiny Object for the desperate, or the get rich quick crowd. Now is the time to get real about getting real results. Showing up to "webinars" that are just pre-recorded sales pitches. Seeing if this new "Guru" showing up in your Facebook newsfeed has the magic bullet. Downloading pre-written swipe files for emails or ads. Joining and posting inside every FB group you can join. Buying expensive courses that only "solve" one part of the problem. And they try to sell you other JV/affiliated courses. Working all hours of the night on your website platform to build out neighborhood pages. Listening to every podcast you can find. Hiring people or agencies that over promise and severely under deliver. Or if you're on a team, you just feel like a glorified, unpaid tele-marketer. Calling people that didn't ask to be called and aren't ready to talk. SO, WHAT SHOULD YOU BE DOING TO MAKE YOUR INCOME MORE CONSISTENT WITHOUT WASTING ALL YOUR MONEY AND TIME? SCHEDULE A CALL, AND LET'S HOP ON THE PHONE AND FIGURE IT OUT. The goal is to assess if I can help you. 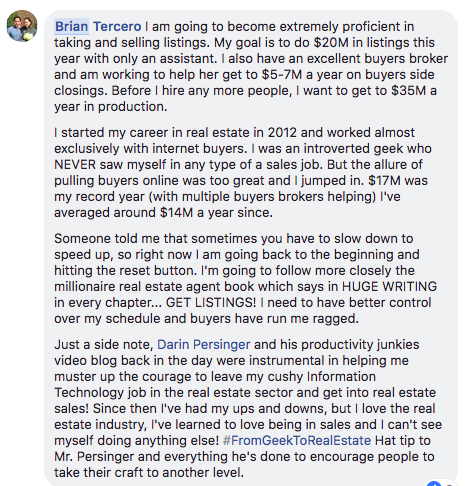 And if so, I'll invite you to learn more about working with Persinger Group or Conveyage. If I can't help you or give some ideas, I'll point you in a direction that can. Maybe a coach, a course, a platform or a book. FREE. No Cost to You. First, know that just because you apply, DOES NOT GUARANTEE that I can get on a call with you. But this is all the more reason to take your time and complete the application the best you can. It could inspire me to make more time in my schedule to get on a call with you or it might help me see an idea and solution I can offer in quick email.